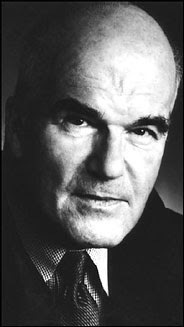 Harry Mathews: I do not think that I expected to become anything else besides an American. I did, I think, have some misguided expectations about changing my spots and fitting into the European communities where I have lived. After stubbing my toes trying to do that, I gave it up, and accepted the fact that I’ll always be an American wherever I live, and no matter how well I know the language. I very much enjoy the life that I have lived in Europe. I enjoy equally being an American, more and more so. I had really no problem with America except in the very beginning when I didn’t know much about it. I thought Amerca was the milieu that I had grown up in, which was just a tiny part of it. I started coming back to America in the late fifties. I visited the West Coast several times, the South a little bit, and Texas, of which I’m particularly fond. I enjoy very much having two places to live, to feel that I could live happily in either Europe or America, to be at home in either place. But I have no illusions;I have no desire to be anything but an American. It’s not something that I think about except in terms of language. In that respect, living abroad is useful. When you’re living in a country and you’re surrounded by people that are not speaking your language, and especially in my case, where your wife and your step-children are all speaking in a foreign langauge, you’re obliged to become aware day after day of what your langauge is. AL: You never thought of writing a novel directly in French? HM: No. I’ve written shorter things, at most three or four pages. That will be about it because it’s only rarely that what I want to do when I write will correspond to my limitations in French. Learning written French proficiently as an adult takes a lot of work, and although it has been done by a few people, they still have a different relationship to the language than someone who has grown up speaking that language. Those people will never write French as well as someone who has gone to school and high school in France. AL: Why do you suppose that is? HM: That’s a good question. I would suggest that the answer is this: one’s relatioship to the language is a dramatic and possibly traumatic one. The experience of learning to read and write, first in terms of just letters and words, then in terms of syntax, is a dramatic and possibly traumatic experience. The writer who has not undergone that kind of drama, which is perhaps only available to people who are between the ages of five and fifteen, will never be able to write as well as someone who has. The theory of language which most appeals to me is one that says the trauma of the absense of the mother’s breast is replaced by words. That is to say the mouth is filled up with words that take place of the breast, beginning with the cry, then articulations of that cry. I think that the teaching of language by the mother to the child, or the family which centers on the mother, is post-traumatic. I think that the trauma has preceded it, and that language can be, on the contrary, a consoling substitute and one that is not alienating. For me, the drama began with finding out that language was not only a link between my body and my parent’s bodies, that in fact the link between me and my family’s surroundings could be alienated by written language. This is just a concept and not a record of what I felt at the time. But something happened then which I think probably happens to other people. There is also the fact that learning is painful. AL: You are part of the Oulipo. Do you think that if you stayed in New York, there would have been that sort of community available? Paris has a history of groups, literary movements,and communities. HM: I had a group in New York long before the Oulipo. The Locus Solus group was my first and most important literary environment. AL: Which was related to the book that came out in 1971: An Anthology of New York Poets? HM: Yes. It was the whole New York that I hadn’t known, that I got to know through Kohn Ashbery. I wouldn’t want to limit it to the people who were on or in Locus Solus, because through them I discovered a community that I could be a part of any time that I wanted to. I wasn’t here in New York very much, so I wasn’t a working member of the so-called New York School. But I was an honorary member. It was something that I knew that I could count on for support and acceptance. The Oulipo plays a very different role. First of all, it’s not a writing group. AL: You meet once a month? HM: Sure. It’s great. It’s wonderful. It’s a sort of a family, no doubt about it. It makes living in Paris much easier. AL: Do you think that such a group like the Oulipo, could have been in New York or San Francisco? HM: Well, in San Francisco you have the Language Poets, but again, that’s a writing movement. The Oulipo is not a writing movement. AL: I was thinking of a group or a community that consciously creates an association of ideas. It seems that in the past American writers have worked independently, but in retrospect, they are thrown together in groups or movements by critics. HM: That’s true in France as well, and it’s certainly true of the writers in the Oulipo. We don’t work together as writers at all. You’re right that it is a group, you’re right that it’s a nice substitute family to belong to, but it’s not a group of writers. In fact, many members are not writers. And those who are writers write in many different ways. We do not necessarily agree with each other about each other’s writing. What we share is an interest in exploring the possibilities of constrictive forms. People in San Francisco, like the Langiuage Poets, Carla Harryman and Richard Silliman for instance, discuss each other’s work; and that’s fine. Theirs is a real literary movement. It’s like Braque and Picasso trying things out with each other and testing their ideas. On the other hand, the Nouveau Roman, for all its fame, was not a true literary group or movement. It was a publishing gimmick, one that worked. AL: When did you first meet Raymond Queneau, and when did you first become aware of his work? HM: I first became aware of his work in 1956. That was before the Oulipo existed. I admired him and actually met him and read many of his books before my or even his Oulipo days. I heard of the Oulipo in 1968. It didn’t interest me at all. I didn’t know what was going on because the people who told me about it, as most people do, got it wrong and presented it in an inaccurate way. Later Georges Perec told me more about it and invited me to one of the lunches. That led to my being elected to the group. AL: So you first met Perec soon afterwards? HM: I met Perec in 1970. AL: How did you meet him? Do you remember? HM: Yes, I remember very well. My first novel, The Conversions, was about to come out in French, and I had left some proofs with a friend who gave them to an editor who worked with Georges Perec’s publishers, and she gave them to him. He wrote me an enthusiastic letter, and I wrote him back. Then we called each other up and met for drinks one afternoon. AL: What did you think of Perec’s writing? HM: When I met Perec, I hadn’t read anything by him. After we became friends I read his books as they came out. I thought of him primarily as a friend: I was interested in his books because they were his. I was neither surprised nor not surprised when he wrote La Vie Mode D’Emploi. AL: You were elected to the Oulipo in 1973, the same year as Italo Calvino. How did this happen? HM: What happens is there are guests of honor who may or may not become members of the Oulipo. I went there and we got along fine. (They used to have lunches, now we have dinners.) I talked a litle about my work. AL: Did they know you at the time? HM: Some of them did. Queneau did. Most didn’t. I do know that I went and had a good time, and they seemed to enjoy my company. Later I received a letter that told me I had been elected as a member to the Oulipo. There was no ceremony. It was totally informal. AL: Did you feel that being elected was a transformation for you, that you and your writing changed somehow, or was the change not significant at all? HM: I was very pleased. It was marvelous to be elected to this group and being accpeted by them. I got involved little by little, and learned more about their ideas. I didn’t know much about them, about the theoretical aspect of it. I had done Oulipian things on my own, but I hadn't thought in general terms about constrictive form. In fact, I guess that you're right to ask that question because one big difference it made was reassuring me about what seemed to be almost an aberration in having written this way. I hadn't known anything about Oulipian procedures. So what before I had felt uneasy about now was given a blessing. That was very comforting. AL: Could you talk about some of the recent Oulipian activity? What have you done as a group and not individually? HM: The work inside the group has led to publications of specifically Oulipian research. Two volumes published by Gallimard, and a whole series of smaller pamphlets which were eventually collected. A third volume of them will be out fairly soon. That's one ongoing part of our activity. Then there are the uses to which individual writers put the Oulipian idea such as Perec, Calvino, myself, Jacques Roubaud, Queneau, and so forth. What happens in the Oulipo is we invent or rediscover or analyze constrictive forms. The books happen outside, independently. The books are our own business as individual writers. AL: So when you write a new novel, does it ever happen that someone like Jacques Roubaud will come up to you and say how he admires your work? HM: Never. At a meeting of the Oulipo, we might say, in parenthesis, to one another "You've written a masterpiece." But we never discuss each other's work except in its explicitly Oulipian aspects. That's not the point. The Oulipo is not about written works. It's about procedures. AL: Is it about production? HM: It's about structure and procedure. Production in the sense of potential production, but not the product. I can give you an example of what happens which is much more interesting for all of us. I've just started a novel last month, and at the last meeting I presented one of the structures that's going into the novel and explained how it will work. But that has nothing to do with what the book is going to be like as a whole, or whether it will be good or bad. I'm glad you asked that because it's important to get that clear. AL: One way the Oulipo has progressed is that it has invented some structural ideas, and then essays about them have been collected into a volume. HM: We have ideas all the time! We have both practical ideas and theoretical ideas. I'm strong in the practical realm. I mean that I'm good at devising things to do. Jacques Roubaud is not only good at devising things to do, he's also a meticulous theoretician. He's very good at defining and working out the theoretical consequences of the general thinking that's going on. AL: Are there some structural ideas that do not get carried out? HM: That's not the point. The point is not the carrying out, but developing the structure. The only carryings out that are important are what we call "record setting." That's what Georges Perec did with the palindrome and the lipogram. He demonstrated that you could write a very long, beautiful palindrome. This had never been done before. He also demonstrated that you could write an extraordinary interesting, entertaining, and fascinating novel without using the letter e. That had never been done before. In that sense, those are actual Oulipian acts because they demonstrate an unrevealed potentiality of a form like the palindrome. There are many natural palindromes. There's no big deal about a palindromic word, for instance. But to do what he did is a true Oulipian activity. Perec demonstrated that the palindrome exists as an extensive form. AL: What are the meetings of the Oulipo like Today? Can you describe one to me? HM: Sure. They all resemble each other very much. There's one on November 16, 1989. A dinner. We'll go to Paul Fournel's, a very good writer, who also runs a publishing house in Paris. He and his wife will welcome us at seven o'clock, and we'll have drinks for an hour or so, then have dinner together. We'll work through the evening. We have an invariable sequence of categories that we work through: first comes "creation," then "erudition," "action," and "lesser proposals," which is a sort of odds and ends. At the beginning of the meal, one of us is picked to preside over the meeting, and someone else picked to be the secretary takes notes on it. We are initially asked if we have contributions to make. If I have something to say in the category of "creation" I'll say "yes, I do." After a few minutes, we have a schedule for the evening. The meetings end about ten-thirty or eleven. There is a slight tendency to rowdiness as the hours pass. AL: So, each meeting ends with a good feeling? AL: Or is there a lot of arguing? HM: Oh, sometimes there is some violent arguing, but the argument is mostly about getting definitions accurate. Sometimes there will be a procedure that is presented which may or may not be Oulipian, and the discussion or argument will be "Is this Oulipian?" Does it correspond to Oulipian principles: if not, why not? If so, why? So there can be some lively discussion. Rarely does someone leave in a state of upset. AL: Your fourth and latest novel, Cigarettes, was popular? Or not? HM: It was more popular than the others. It certainly didn't get to a lot of readers. AL: It was translated into French soon after its publication here, in the States, in late 1987. When did you start this novel, and when did you finish it? HM: Ah, that took me forever to write. I think that I began it in 1978, and it took me eight or nine years to write it all. A lot was going on at the time. I did work on it more or less continuously. It was very hard formally to handle, and I gave myself a lot of strict rules. I was doing things that I had never done before. That was one of the rules: not to do anything I had done before. AL: To me at least, one of things that I noticed about Cigarettes is that it seems like was written by a female writer, if you don't look at the cover. Surely the texture of the language is more feminine. HM: Oh, that's nice to hear. I agree with that. I hope it's true. AL: Female writers, especially female writers who write popular or romance novels, usually write in forms familiar to everyone though. HM: The form of Cigarettes isn't familiar to anyone, but the language is. Although a lot of people found it difficult. I was astounded at the number of people. To me, it was utterly transparent. Many people found it difficult, especially the beginning, and that totally baffled me. AL: Yes, I think that I had some difficulty with the first part of the book originally. But soon as I became more accustomed to the book, it became more fascinating as it unfolded. It worked. I think that the reader must rely on memory more with this book than with others. HM: But that applies to any detective novel, sometimes far more so. AL: Your most recent books, 20 Lines A Day and The Orchard, are much different. One is a journal and the other is a memoir. Can you talk about how these works came about. HM: They were very important to me, as was The Armenian Papers, all three. 20 Lines A Day and The Armenian Papers were written without any idea of what was going to happen. They were written off the top of my head. It was a surprise to me how they came out. Jacques Roubaud said that after working as an Oulipian for twenty years, my instincts were geared to intuitive forms. Or at least I had enough intuitive formal sense to be able to wing it without a structural procedure in mind. I was interested in 20 Lines A Day particularly, because of the processes expressed in that book. I don't mean formal processes or writing processes, but the psychological process of writing each day. That was something that I didn't know. That seems to be what the book is about. It is coming to terms with myself when faced with a blank page each day. AL: Other than that process, is it that you don't like to repeat yourself in following the same approach to writing, and if so, is it due to boredom that you avoid writerly habit? HM: Every book is different in the way it is written. I do not think it's a question of being bored. I think I’m drawn to trying different things. AL: I wanted you to comment on the phrase "The wealthy amateur," the first words of The Conversions. AL: And this phrase also shows up in Perec's book. AL: Yes. And another character. He is described this way. I'm not sure that I understand this phrase. It sounds like something out of a novel by Jules Verne. Is there some special significance behind it? HM: No. Grent Wayl is like the protagonist in Impressions of Africa. He's like the people in the novels of Raymond Roussel generally. He's like Roussel himself. Roussel as a writer was really an amateur. He was an amateur in other fields. I don't understand the question. The opening of The Conversions is a very loaded sentence. There isn't an explanation. There's no hidden meaning. AL: I thought that there was a problem here, that this phrase was some known designation of the past. AL: The Way Home is a book published by The Grenfell Press (Leslie Miller). You collaborated on this book with the artist, Trevor Winkfield. Your short story is there next to photoengravings by Winkfield. More and more recently I have seen these editions coming out with artists and writers collaborating. HM: They have been doing this for a long time. It's become profitable now. Speculators have now entered the market, so there is a market for it. More than there was at one time, thirty years ago. Then, even poets like John Ashbery, Kenneth Koch, and Frank O'Hara were doing books with painters. AL: What is an average day like for you now? HM: I get up around eight, and have breakfast. I usually read part of The Economist, or if I've finished that, I usually read part of a book of contemporary history. I work from about nine till one in the afternoon, till lunch. That is my goal. And after lunch, I may work again. There's usually a lot of things that arrive in the mail that need attending to. This week I've been spending an half an hour in the afternoon proofreading the copyedited text of a bunch of critical essays. There are things like that. I schedule myself, but I don't always keep to the schedule. That is the only way I get anything done. When the work is all done I usually play the piano for an hour. It's fun and games from then on. In Paris, I'm usually with my wife. We talk, read, or go out. It depends. It's the social part of the day. My days are pretty much alone, except for lunch with Marie. AL: And she stays in Paris when you come to New York? HM: She comes with me when she can, but she has a daughter who is still in high school. AL: You have a new novel on the way? HM: It's called The Journalist. Immeasurable Distances, a book of critical essays will come out in December 1991, published by The Lapis Press.